“Do you know why you are here?” the stern man asked. He was tall but heavyset with longish white hair and a goatee. He did not look like a spy. He looked more like an innkeeper. Kevon shifted uncomfortably on the wooden bench. “I believe so,” he said. His mother. Kevon looked away. He didn’t want to have anything to do with his mother. Not any more. Not after what he had found out about her. Master Sadao turned on his heel and walked across the office. He snatched up a globe from a shelf of the large bookcase that took up nearly one wall. 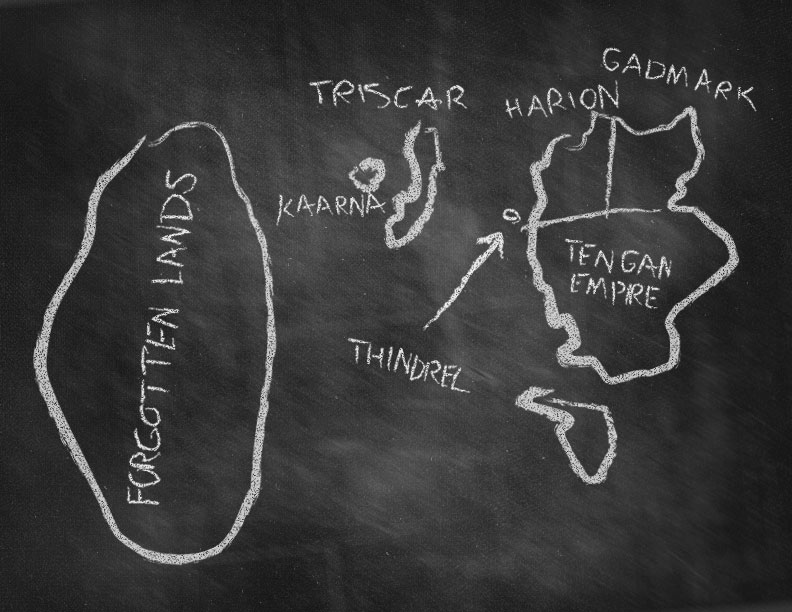 “Tell me of the lands of Tomira,” Master Sadao said. He put the globe behind his back so Kevon could not see it. Like a bolt of lightning, Master Sadao covered the two yards between them and smashed his hand down on the bench with a loud crack. Kevon jumped, startled, and nearly toppled off the bench. Kevon thought hard, tried to review what he knew of the world. Started with Triscar, of course. Then pictured each land, floating in the ocean. He couldn’t think of any other continents or islands. “Sit here at the desk,” Master Sadao said. He had set out a large square of slate and a piece of chalk. And with that, the tall spy left the room. He took the globe with him. Kevon looked down at the slate. He thought for a while. Then he tentatively scratched out what he thought the world looked like.